A Tattoo is a permanent staining of skin, done by specialised needles to carefully insert special kind of inks deeply into the skin with specialised equipment in a decorative fashion. Tattoos are generally used by people as a statement of their personal beliefs, or for specific identification purposes, or as a fashion accessory for beautification. Rose tattoo designs are one of the most used and most popular designs and in constant demand from the olden times up to today. A rose is aptly described as the ‘Queen of Flowers’ with respect to its riveting loveliness, encasing a labyrinth of velvety petals, entrancing the bystander with its imperial fragrance. A rose tattoo design is a popular and favourable design requested by females as well as males. It is mostly preferred by women although men also sport it symbolizing their valentines or simply a tender side to their thorny exterior. The imagery of a rose is generally linked to feelings of love and romance, but knowing the real illustrative meaning of the colour of a rose tattoo is definitely edifying. For example, a deep red rose indicates passion and adoration while a white rose would denote chastity and peace whereas a black rose would denote black magic or the darker side of love. A purple rose signifies enchantment and the famous pink rose for sweetness etc. The rose is undoubtedly associated with feelings of love and various affectionate emotions, yet different colours of roses will represent different meanings. A dark red rose, for instance, symbolises love, passion, and romance. A white rose signifies purity, honesty, and innocence. Where as black roses stand for death and the dark world. A blue rose has a resemblance to impossibility and having a golden rose tattooed indicates achievement or success. Yellow roses on the other hand generally indicate friendship or loyalty and so on. The symbol of rose tattoo designs occupies significant stations in spiritual and divine representations. The beauty of this exquisite flower holds references and interpretations for many historic icons and legends. A rose symbolises the Greek goddess of Love, Aphrodite, who was stunningly beautiful according to the mythology and from where her blood dripped, the most beautiful voluptuous red roses grew. There are many ways to inscribe a rose tattoo on your body, from plain ornamental rose as an arm or tattoo on the back or shoulder or for other larger parts of the body as a climber stretching over the shoulder or spanning the spine or even calves. A rose tattoo design undeniably delineates charm, style and elegance. Rose tattoo designs can vary from a single rose flower on the shoulder, back, ankle or arm or even neck, to a whole vine of roses draped across the shoulders or from the neck down the spine or even from the hip down to the ankles. 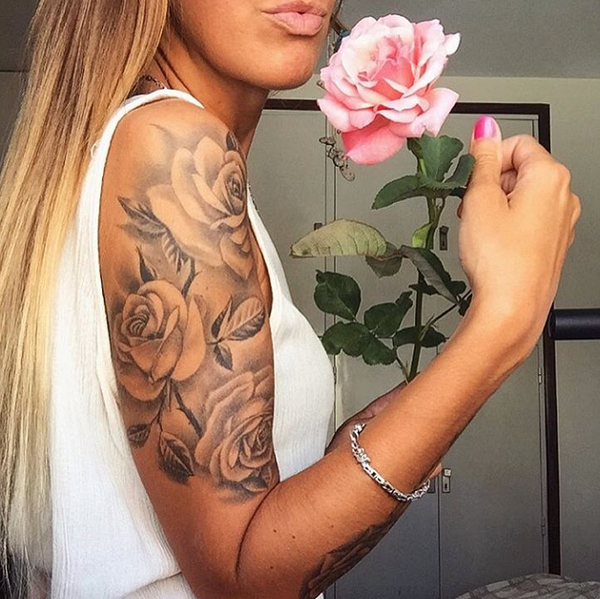 However simple or extravagant the tattoo is, a rose tattoo design defines class, trend, and beauty elegantly. Colourful tattoos add to the richness and beauty giving meaning and splendour to your personality.